Lynda Libby is working on an intricate handkerchief edging. The wooden bobbins are each holding one strand of thread, and she manipulates the bobbins and thread to create the lace. Lace, specifically bobbin lace, has become an important part of Lost Notes, my 19th century epic novel. It showed up in the background of the first draft, but now, in the second draft, I’m weaving bobbin lace into my plot. Reading about a craft isn’t the same as seeing someone do it. With that in mind, I contacted Lynda Libby from The Portland Lace Society. She invited me to the group’s monthly meeting at a local community center. I spent two hours on June 7 watching these amazing women cross and twist their bobbins to create incredibly tiny gauge works of art. In bobbin lace, each thread is attached to its own bobbin, and pairs of them are manipulated over and under each other in a way that creates a beautiful pattern. Historically, bobbins were made by local woodcarvers, so they were not standardized. 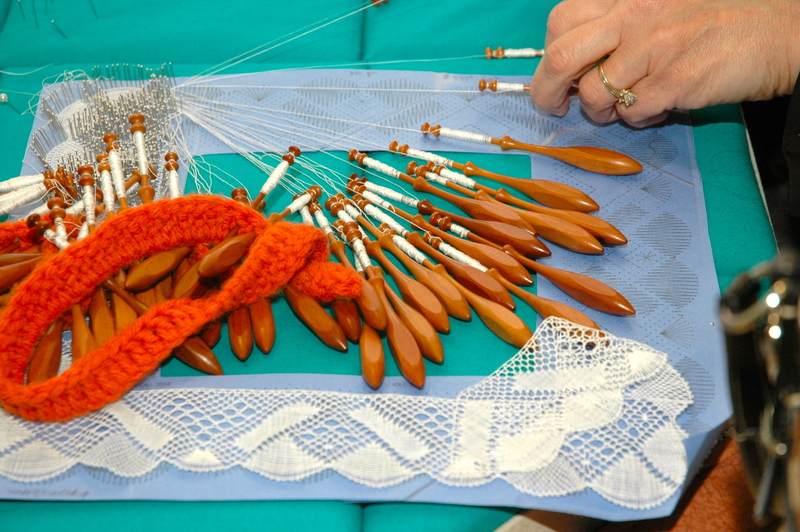 “All across Europe, all these different woodcarvers would make bobbins, not knowing what the other woodcarvers were doing,” explained Alice Howell, who is very knowledgeable about bobbin lace history. The bobbins were made according to the skill of the local woodcarvers, the specifications of the most important lace-making woman in the village, and the weight of the thread that village used, Alice explained. Fine, expensive thread, such as silk, meant a lighter weight bobbin. Alice told me that 18 strands of silk would equal one strand of today’s sewing thread. Wow. On June 7, Alice was working on a pattern from the 1600s from Antwerp, Belgium, using linen thread. As a knitter, I was fascinated to realize that bobbin lace makers use different kinds of thread depending on what’s available and what effect is desired. Cotton is easiest to work with, Alice said, due to its smoothness. It slides nicely into place. Linen has more traction and lasts for a long time. Silk wears out fastest. Often lace-makers use what their teachers use. After learning such fascinating facts from Alice, I moved over to watch Lynda work on her handkerchief edging. She showed me how she manipulated four bobbins at once, demonstrating crossing and twisting. I imagined that twisting would involve taking two bobbins and turning them in a circle to twist the threads together, but I was wrong. Lynda, a book binder by trade, learned bobbin lace 22 years ago in the Netherlands when she had three preschoolers and was pregnant with the fourth. You can see some of her lacework on her website. Shelley showed me how to wind bobbins. She had a bag of them and needed to wind about a yard of thread onto each one. The thread must be rolled onto the bobbin so it doesn’t twist. Sandra was working on Bucks Point lace–an edging for a hankie. I also received excellent information and guidance from Pauline, Shirley and Lise. Thanks to everyone from The Portland Lace Society for answering my questions and showing me your work. This entry was posted in Community, Fiction, Research, Writing and tagged bobbin lace, historical fiction, Laura Stanfill, writer. Bookmark the permalink. I watched someone doing this in a demo during one of our travels. It’s fascinating and i have no idea how they keep all the bobbins straight – mind would be a rat’s nest. I don’t think I have the patience of a lace maker. I’m looking forward to writing scenes where my main character makes a tangle like that, Lynn! I’m going to send this link to an artist friend of mine. She mostly works in ceramics, but she has also worked with fabric (and she has also been a book-binder). She may be interested. I feel really lucky to have stumbled on this helpful group, Anthony. Amazingly enough there was another local novelist there observing, too, and it was fun to exchange contact info with her. Thanks for sharing the link with your friend! I actually saw women making lace in a little shop in Bruges, Belgium. It was fascinating! I bought a lace book-marker, its precious. So cool, Maggie! Another novelist I met at this lace group is focusing on Bruges lace. It seems like each region had a particular specialty. Laura, what a great post and how fortunate for you that you could do on-site research. To watch their hands moving as they create a beautiful piece of lace must have been a thrill. I know a little about bobbin lace and watched my mother’s cousin use those funny looking bobbins, weaving them in and out of each other. I could never understand how they managed to make something so pretty from what looked like a tangled mess to me as a kid. As a little girl, my mother worked what was called “piece-work” … that is women in the factories were not paid an hourly wage but by the number of pieces they produced each day. Hand sewers or what they called “finishers” were also in high demand with local taylors. I watched my mother and several other women as they stiched silk ties by hand. Countess Mara was one of the most expensive and when she worked on those, she was thrilled. I was also fortunate to watch the women in another factory who did hand beading. They often used small handmade pieces of lace and beaded them for an expensive dress. Each woman had one small part of the garment. How amazing to have watched your mother’s cousin work, Florence. And thanks for sharing your piece-work story and memories of watching beading. Research is something I enjoy doing for my novels. I’ve never done anything as in-depth as this, but someday, maybe! This post reminds me of the book The Lace Reader by Brunonia Barry. http://www.lacereader.com/read_lace.php I read this book a few years ago, and I found the concept really interesting. I’m impressed the lengths you have gone to do your research. I think it will make all the difference in your book. I should reread The Lace Reader! My book is very different but I’d be curious to go back now and see how she used lace. I hope my research makes the difference! We’ll see. For every plot addition in this draft, I seem to have a host of new topics to study. Hi Laura, this is really interesting. I remember when I was in Bruges watching a woman in period costume tossing and weaving lace so fast and with so many bobbins that it was mind-boggling! I cannot imagine ever mastering such an art. Wow, Naomi. That must have been so cool! I love that this old art is still being done masterfully. As I mentioned in responding to Maggie, a novelist I met while visiting this group is studying Bruges lace and is going there to do more research. Hopefully she’ll get to see the same kind of historic demonstration. There were several lace shops off the square where you could just stand and watch. It was fascinating! I used to make lace this way. When I was about fourteen I found a group of lovely elderly women in my local library who all say in a big circle with their bobbins, threads and boards. I think they were so touched by my fascination that they gave me some kit so I could try it out. I made bookmarks and table cloth edging for almost a year until one of the ladies died. I was too young to figure out how to cope with that loss… I never went back to the group. Its a real shame but I’ll always remember the beautiful things we made. I still have all the bobbins they have me. Ileandra, what a beautiful story and an amazing memory to cherish. I bet they just adored your fresh teenage energy and outlook, and I also bet they understood what happened. I love that you have the bobbins; bobbins are becoming rather talismanic in my novel and I’m enjoying writing about them. Thank you so much for sharing!